Bandon Cabin is a luxury golf vacation home. This spacious cabin is located less than 2 miles from the main entrance to the Bandon Dunes Golf Resort, enabling golf enthusiasts to play four of the best and most highly acclaimed Golf Courses in the United States: Bandon Dunes, Pacific Dunes Old Macdonald and Bandon Trails. 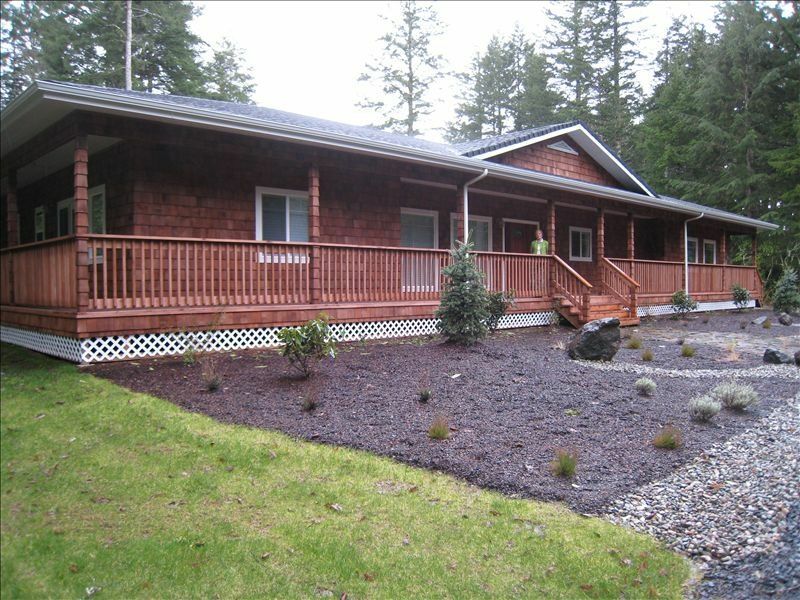 Bandon Cabin is a 4,000 square foot home, built in 2007 on 1.25 acres of beautiful Oregon land. The house is surrounded by 60-foot pines and it is less than a mile from the Pacific Ocean. You can hear the pounding of the surf in the breeze. Bandon Cabin is designed for 8 golfers. The modern kitchen, deluxe great room and large outdoor deck provide ample room to relax and enjoy your stay. Each bedroom has two Queen beds, a flat panel TV and an en-suite bathroom. The Great Room has an 8’ pool table, a 50' flat panel TV and a large card table for game playing or casual dining. There is also a formal dining room. The hot tub makes for the perfect ending to a day of golf. Home owner, golf lover and avid out-doors man. Our property is located within a mile and half from Bandon Dunes Resort. The house was built with golfers in mind. Each bedroom has two queen beds with a TV and attached full bath. There is a great room with a 50 inch TV, billiard table and professional grade kitchen. Close to Bandon Resort, modern and new. Two large tables that can seat up to 16.
great weekend! perfect place for a golf get away! I rented for a mini-family reunion; it was perfect for that occasion. The bedrooms are well insulated, so noise in common area does not disturb sleepers. Overall it was a very comfortable place to stay. Excellent for our Guy's trip! We had an absolute blast at the property. Our group of 8 went down Bandon for a bachelor party and it didn't disappoint. The whole house was excellent. Each of the 4 rooms had two queen mattresses and a large bathroom which gave everyone the ability to really spread out. The pool table and poker table were great entertainment during the evenings on top of spending some time in the hot tub after a few rounds at the course. All together, we really enjoyed our stay and would definitely recommend it to anyone with a larger group. Place was nice, secluded away from everything which is nice gave us good family time together. Great size for eight golfers. Had enough room to spread out and then a great room to socialize and have some fun. Very close to resort! It made for a great long weekend. We enjoyed a fabulous weekend with our closest friends (four couples) at this beautiful home. This is a 4,000 square foot, single-floor home that provided very comfortable (spacious) environment to socialize, while also providing adequate privacy for individual couples. We took full use of the spa and pool table as well. The weather was typical for Oregon in the winter. One one day the winds were 70 mph, however the house was so sheltered by trees we didn't have ANY negative impact by the wind. We were able to walk to Bandon's Old McDonald golf course in about 20 minutes. This is a great house for golf groups and/or couples getaways. I hope you enjoy it as much as we did.